Apple’s offering of a rare mea culpa in the Antenna-gate scandal has shocked many in the tech business. Here’s everything you need to know about Apple’s apology press conference in one handy list. Apple went to great pains to demonstrate that this happens on other phones, such as the Droid Eris and Blackberry 9700. Apple claims that stats show the iPhone4 drops less than one call more (per 100 calls) than the 3GS. This is an impressive stat given that the iPhone 3GS had a 6% return rate, which was still better than AT&T’s average. The white iPhone4 will be released in July. Apple plan to remedy some issues with the proximity sensor in the next iOS update. 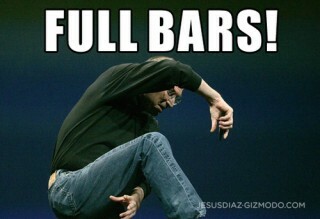 Jobs also acknowledges that the bumper fixes the problems with the phone. In the meantime, they’ll offer a selection of cases to users. Getting a case is as easy as applying on their website. This is because Apple isn’t necessarily on the best terms with third-party case manufacturers because they have spilled details on what new products will look like by showing off new cases, or so says Jobs. Thanks to Engadget for the photos.